Single-phase power is sufficient to run Sukup's 16-foot centrifugal dryer, with up to 50 horsepower motors. 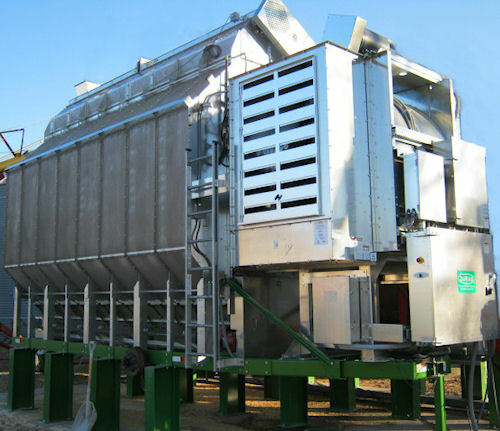 The development of an on-board power conversion system for its 16-foot centrifugal dryer is helping Sukup offer its products to growers with only single-phase power – without costly wiring additions or external phase converters. The new circuitry in the Sukup Single-Phase Centrifugal Dryer offers on-board power conversion and the capacity to run fan motors up to 50 horsepower. The innovation makes the dryer a "plug-and-play" tool for farmers with single-phase power and allows them to dry more grain with bigger equipment than they have been able to in the past. For more information on the Single-Phase dryer and contact information on a dealer near you, call (641) 892-4222. Sukup adds circuitry to centrifugal dryers to help operators with no three-phase power get the most from their dryers without external phase converters.